Among the most widely used tails in fly tying, for streamer wings, hair wings and tails and hackles. A fine textured, durable hair for winging steelhead, sea-run cutthroat & streamer flies. It will remind you a little of marabou but has zero waste. Great for Intruder prop dubbing balls, and mix in your composite dubbing loops. Amazing new backwoods varmint. The hair has a strong natural translucency similar to seal or polar bear. These special giant rats have a 2-2.5 inch multi hued fur. Guard hairs are usually white or light tipped. Strips are cut 1/8 wide and can be wrapped over the hook shank for a full bushy body, or can be tied on as a wing for lots of wiggle like a normal Zonker streamer. Widely used in Europe now on tube patterns. 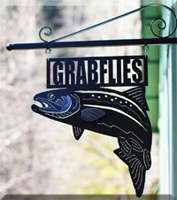 We love them for steelhead flies like moals and intruders or ant tube pattern. Also very nice as a pike/Muskie flies.